RRB ALP 2018-2019 – Railway Recruitment Board (RRB) has released a notice for the RRB ALP CBT 2 revised result. The RRB ALP CBT 2 2019 result will be declared again in online mode at the zonal websites of the RRB in the form of merit list and score. However, as of now no new result date is released by the board. As per the CBT 2 result, the aspirants of Loco Pilot will be called for Aptitude Test, followed by Document Verification. Whereas, the Technicians will be directly called for Document Verification. RRB ALP Recruitment is open for 64371 posts, out of which 27795 vacancies are for Loco Pilot and 36576 are for Technician. Check details on RRB ALP 2018-19 dates, syllabus, exam pattern, selection, and more from here. Latest: RRB will again announce the RRB ALP CBT 2 Result. Click here to know in detail. Nearly 48 lakh candidates applied for RRB ALP / Technician Recruitment. Those who qualified for RRB ALP Stage 1 were called for Stage 2 CBT. The CBT 2 was held from January 21 to 23 but for candidates who were not able to give exam due to technical errors, the exam was held again on February 8. The candidates can check all the important dates for Loco Pilot Recruitment 2018 from the table below. The RRB ALP CBT 2 Result is announced in online mode at the zonal websites of the RRB. The result is declared in 2 forms merit list and scorecard. RRB has also released the cut off category wise for each zone. The score is available over login for which user id and date of birth is needed. The merit list is released in a pdf format which consists of the roll no. of the candidates qualified for the aptitude test and document verification. The merit list consists of roll number of only candidates who have qualified the CBT stage 2. Whereas, the scorecard is released for all the candidates who have appeared for the stage 2 examination. RRB does not send the scorecard to the postal address of the students. Candidates need to score 35% marks to qualify for the exam. The Aptitude Test is only for those applicants who have opted for the post of only ALP or both ALP & Technician posts. RRB ALP 2018 Recruitment Aptitude Test marks will be considered for final merit list preparation for ALP Posts. Candidates are advised to visit websites of RDSO for question patterns and other details of Aptitude Test. The number of candidates shortlisted for this round is 8 times the number of vacancies. For the computer based aptitude test, candidates have to present the vision certificate. In case, a candidate fails to produce the relevant document then he / she is not going to be allowed to sit for the examination. Candidates who will be clearing this round will be called for the document Verification. RRB has laid certain points for the Aptitude Test. Check the points mentioned below. By the Aptitude test, students get to know their strength and weakness. It is fair for all the candidates. People who perform well in the exam will simultaneously do good in the job. The test is helpful for the candidate to adjust in the job. Click here to download the sample paper of Computer-Based Aptitude Test. Note: Candidates are required to obtain 42 marks in each of the test battery to qualify the exam. 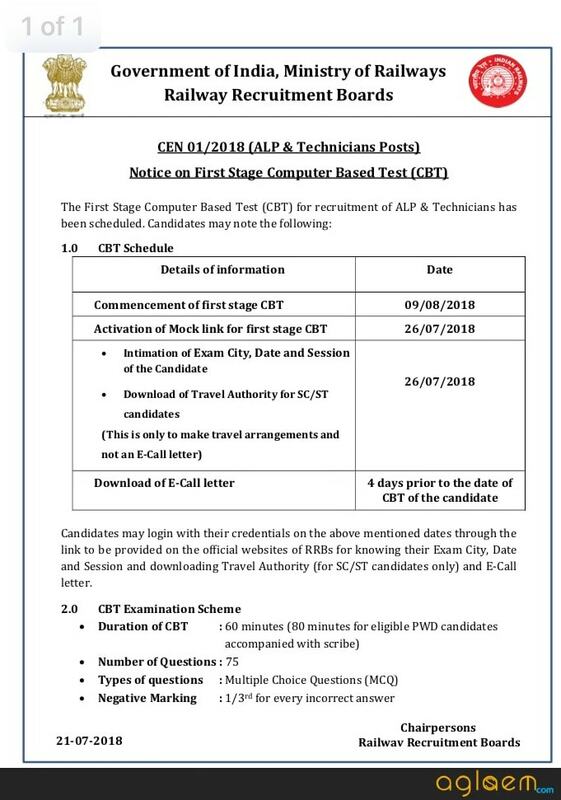 Candidates applied only for the post of Technician are called for the Document verification round directly after the CBT Stage 2 exam. As per the candidates’ performance in both Part A of the Second Stage CBT and Computer-Based Aptitude Test, subject to their qualifying the Part B of Second Stage are called for the document verification. Candidates equal to the number of vacancies are called for this round. 50% more candidates are called for this round as the standby list. The document verification round is conducted to check that the candidate is eligible to be selected for the post or not. Candidates can present the document only in English or Hindi. In case the certificate is in some other language then one should present the self-attested translated version of the same on the document verification day. Here is the list of documents which candidates need to for the DV round. Income Certificate for Waiving Exam Fee. Original Discharge Certificate for ExSM. NOC from Serving Defence Personnel. Minority Community Declaration on Non-judicial Stamp Paper. Receipt of Payment if done through challan or SBI or Post Office Challan. Self Certification by Transgender Candidates. Decree of Divorce / Judicial Separation from Court of Law. Spouse’s Death Certificate (In Case of Widow). Ex-Servicemen candidates who secure civil employment after applying for this CEN should give self-declaration to the concerned employer about the details of application against this CEN, as soon as they join. The final appointment of the candidates is done only after passing the requisite medical exam which will be held at the Railway hospitals. RRB ALP CBT 2 Official Answer Key is released on the official website of different RRBs. This Answer Key is also the response sheet, where candidates can also check how many answers they marked correctly. Through the Answer Key and Response sheet, candidates can calculate the raw score in the exam. Apart from the Response sheet, the facility of objection is also provided to a candidate, using which, the candidates can point out the discrepancy in the Answer Key. The RRB ALP Admit Card is available from January 17 on the official website of RRB. A candidate can download the Admit Card by entering the Registration Number and Date of Birth. The Admit Card contains basic details like name of a candidate, date of birth, exam venue, shift, etc. A candidate can’t take the RRB ALP Stage 2 CBT without the Admit Card. A candidate should bring a clear printout of the Admit Card and must leave some space for the Self-declaration, left thumb impression and signature, these activities must be done under the presence of an invigilator. Along with the Admit Card, a candidate must also bring valid ID proof and a photograph. Candidates can check all the important details about RRB ALP CBT 2 from here. Stage two of the RRB ALP 2018 Recruitment exam is divided into two parts. Part A and Part B. Part A marks are used for merit preparation, while part B is another qualifying examination. Duration of the exam will be 60 minutes but PwD candidates will get 80 minutes. Questions will be from the trade syllabus by DGET. General Intelligence and Reasoning: Analogies, Alphabetical and Number Series, Coding and Decoding, Mathematical operations, Relationships, Syllogism, Jumbling, Venn Diagram, Data Interpretation and Sufficiency, Conclusions and decision making, Similarities and differences, Analytical reasoning, Classification, Directions, Statement – Arguments and Assumptions, etc. The trade syllabus can be obtained from here or from the DGET website. The first stage if for all candidates. It is just a screening examination and you need to clear this examination in order to be eligible for the next stage. Syllabus of RRB ALP Recruitment 2018 is given here for exam preparation. Candidates can get the railway recruitment syllabus from this page. General Science: The RRB ALP Technician Syllabus 2018 under this shall cover Physics, Chemistry and Life Sciences of 10th standard level. You can check CBSE Class 10 Science Syllabus for the same. Also, you can check NCERT Books of Class 10. The question paper of RRB ALP examination has been provided by the Railway Recruitment Board. Click Here to view CBT 1 exam question paper with answers. RRB ALP Revised Score 2018 can be checked from the login, by entering user id and password. Click the link below to access the login. Result: Click Here to check RRB ALP Revised Result 2018. The merit list of RRB ALP 2018 is released as pdf. Every RRB uploads the merit list at its official website. To check it, candidates need to choose their RRB and then scroll for the PDF. Use the links below. Railway Recruitment Board had to cancel the result of RRB ALP. The Board announced it on November 02 but soon the result was scrapped. The Board took such decision because there was a certain irregularity in the answer key which was not corrected during the result preparation. Hence, the announced result was not accurate. Soon the Board realized the error and corrected it by taking down the result. Railway Recruitment Board (RRB) has increased RRB ALP and Technician vacancies from 26502 to 64371. Earlier, the recruitment was open for 17673 ALP and 8829 Technician posts. However, now the total vacancies for Loco Pilot and Technician is 27795 and 36576, respectively. The number of vacancies for RRB ALP and Technician Recruitment 2018 has been increased. The new and old number of vacancies can be checked from the table below. Who is an Assistant Loco Pilot? An Assistant Loco Pilot is the one who assists a Loco Pilot in driving or piloting the train. This includes calling out signal as soon as he sees someone, fine-tune the Loco, attend small repairs of the Loco. The assistant loco pilot should be always alert on duty and responsive. The responsive nature of a person who wishes to work as an ALP is tested in the aptitude test conducted by Railway Recruitment Board. After becoming ALP, the next promotion leads to being Sr ALP, and then LP. LPs can write exams for various positions like loco foreman, loco supervisor, crew controller, power controller which have the benefit of getting running allowance without actually running. Candidates who appear for ALP undergo computer-based tests, aptitude test, document verification. Those who appear for Technician undergo a computer-based exam and document verification. You should start studying for the RRB ALP 2018 if your aim is to crack it in single attempt. Otherwise, you will have to wait for 2-3 years as these recruitments happen at a gap of 2-3 years. Candidates should satisfy themselves that they fulfill all the RRB ALP & Technician Eligibility Norms including Age Limits, Education Qualifications, and Medical Standards. Eligibility criteria is as follows. Candidate should be between 18 to 30 years old as on 1 July 2018. Age relaxation will be as per notification. In short, to satisfy lower age limit, for all candidates, their date of birth should not be later than 01 July 2000. Now coming to upper age limit, for UR candidates, DOB should not be earlier than 02 July 1988. For OBC NCL, it should be not earlier than 02 July 1985. Similarly for SC/ST DOB should not be earlier than 02 July 1983. Other category candidates may please calculate it as per above table. As can be seen, you are eligible for age relaxation if you are in any of the categories. However please make sure that you have documents to support category claim. For Assistant Loco Pilot: You should be Matriculation / SSLC plus ITI / Course completed ACT apprentices OR Diploma / degree in engineering. For Technicians: You should be Matriculation / SSLC plus ITI / Course completed ACT apprentices OR 10+2 with Physics and Maths OR Diploma in engineering. Government job aspirants, especially those who wish to work in Indian Railways, can take view other articles of RRB ALP 2018 from below given links. Medical standards are very important for assistant loco pilot posts. Especially factors like eyesight are critical. Make sure that you are medically fit as per Chapter 5 of Indian Railway Medical Manual Vol.1 which you can download at www.indianrailways.gov.in. There are more than 1 crore government job aspirants in India. When the Railways had conducted NTPC recruitment, 92 lakh candidates had applied (this was officially announced). So you can see that a massive number of job seekers including you are going to appear for RRB ALP 2018 examination. The number of vacancies is very high. There are 36576 vacancies of various posts of Technicians. If your result is awaited then you are not eligible. 18 to 30 years old candidates can only join. Level 2 of the seventh pay commission pay matrix is applicable which comes out to be Rs 19900 plus allowances. those person who have qualified in rrb alp stage-1st after revised result some change in score or not. You have to contact officials as soon as possible. Sir any chance to edit form because I write wrong matriculation roll no. Once your application submitted then You can’t change anything. Please inform the absolute date of CBT 2 result publishing.